The stories you will find below have been adapted (by your humble host) from Fairy Tales by various authors and from various places. All authors are credited below...at least I have supplied the names of the books I found these stories in... Fairy Tales are, of course, older than we will ever be know, and everyone is a "reteller", including me. 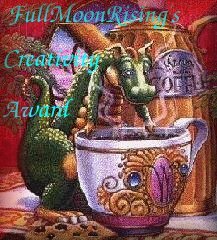 An award from Fire Faery...Thank You! Fairy Tales, Folk Tales and Mythology Ring.